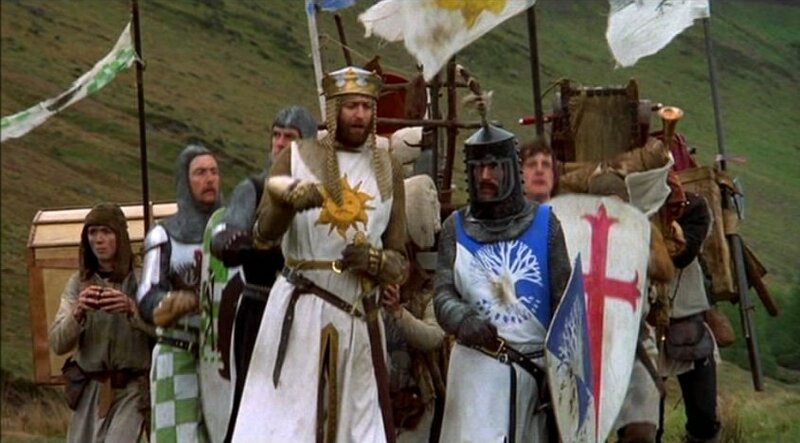 Introduction: Dead parrots and plummeting sheep, to say nothing of Spiny Norman and the Minister of Silly Walks, are at best unlikely companions for the Knights in Quest of the Grail. All, however, feature in the amazingly diverse, inclusive, bizarre, and absurd repertoire of Monty Python, the comedy troupe that dominated Public Television in the seventies. The brilliantly inventive troupe had predecessors in popular culture (Music Hall skits and the British Christmas Pantomime), earlier smart young university wits (citing Christopher Marlowe might claim too prestigious a heritage, but the successful Beyond the Fringe group – Peer Cook, Jonathan Miller, Dudley Moore, and Alan Bennett – surely established a precedent), and contemporary theatre practice and theory (both the waning of ‘Absurdist’ theatre and the growing awareness in England of French theory). They had an easy time playing the Existentialism (placing Mrs Jean Paul Satre on a sinking submarine, for example), but some of the great experiments in Monty Python and the Holy Grail seem to reflect French theory filtered through the practice of French film-makers, like Jean Luc Godard (who made it clear that making a film is form of film criticism) and Robert Bresson (who Lancelot du Lac seems to have inspired the famous encounter with the Black Knight). The destruction of film tradition, if not film as a medium, begins in Monty Python and the Holy Grail with the famous mobile credits. The joke of the credits, to which I shall return, involves the ludicrous Swedish subtitles, but the location of the credits alone raises an interesting issue. These silly subtitles were, when the film was released, placed at the end of where an audience ordinarily expects to find them these days. The tape and DVD releases place these credits at the beginning. The original placing of the credit at the end accomplished the useful, if accidental, purpose of encouraging audiences to stay until the end of the film and taught them that finding out who did what can be an informative and entertaining exercise. This placement did, however, undermine the stark ending of the film.